Terminology here is disastrous. At least on this site, we will use the term “scallion” strictly to refer to the intended use, not the kind of plant. In this sense, “scallions” are those member of the great “onion family” that are grown for culinary use as thin, fairly lightly flavored use in salads and (especially in oriental cuisines) as cooking ingredients. A great many surprisingly different plants are grown for use as (and incorrectly called) “scallions”. These are “ordinary” (bulbing or “dry”) onions, Allium cepa, that are simply harvested while yet immature; these need not be, but usually are when grown for use as scallions, white types. A plain, old Spanish White bulbing onion can be harvested early as “green onions”. A variation on that is A. cepa types that are “short-day” varieties (see the discussion at Onions) grown in long-day climates, or vice-versa: such growing is usually a gardener’s mistake, for the plants cannot form a head; but in the case of scallions, that is just what is wanted. The basic onion variety used, however, is said to make a real difference in culinary quality, for scallions should not be as pungent as real onions, and even “green” onion greens are pretty raw (and tough). In our locale, one could probably try Vidalias, or Walla Wallas grown spring to fall instead of over-wintered, but why bother? Bunching onions come in both red and white sorts. Moreover, they also seem to roughly sort out into two categories: large-stalked and small-stalked (based more on thickness than height, though that varies, too). Varieties that are winter-hardy in a given climate can be made perennial (“It is common to see it harvested from under snow”), with occasional clump divisions for continuing propagation (“Once you have established some clumps, simply harvest as needed, divide clumps, and replant for the next crop”). Being perennials, they are much more attractive to the home gardner than “green onions”, which need to be re-seeded annually. They require, of course, a dedicated patch of ground, but not—for most households—a particularly large one—or they can be grown in a container, size dependant on your appetite for them. Colorably the best cultivar now available is the green Ishikura Long Winter, of which one gardener in Pennsylvania says “Here it gets -20F with continuous,deep snow, but they survive without any protection.” Hard to beat that performance! If you are a fanatic about novelty, there are those red cultivars, too. Probaly the best, though likely not at all so hardy as the Ishikura, is Red Beard; try it if you like. Of course, if you are container-growing scallions indoors, hardiness is immaterial; but the Ishikura is reportedly fine-tasting. It is quite possible to grow scallions indoors in a container as a perennial. We will be succession-growing them along with ball carrots, cress, and (in a separate container of course) radishes, for salads year round. Seed for bunching onions can be sown in spring or fall, but if we’re going for a perennial stand we might as well start it in spring and let build up some body before hitting it with its first winter. They’re cold-hardy (or we couldn’t perenialize them) but there’s no point in pressing the issue when we’re planting for continuing use. They grow best at a daytime temperature of 80° F., which we hereabouts first hit, on average, in middle June; our inclination would be to sow outdoors around May 1st, when the high is typically 65° and the low a little above freezing (the catalogues from climates like ours refer to sowing in “early spring”, so that should be fine). Give them reasonably rich soil, with a pH between 6.3 and 6.8, which is typical of most good garden soil (they dislike strongly acid soil, but a soil pH below 6 is rare in the western U.S.). Well-drained loams or sandy loams high in organic matter and rich in phosphate are optimal; if your soil is a heavy clay, amend it, with sand if necessary but preferably with organic matter. These are usually direct seeded, especially as we normally want a number of individual plants. They can be spaced rather closely, down to 2 inches in a deep-dug or raised bed, though a 3-inch spacing is probably better for perennial plantings, giving them a little elbow room to form their “clumps”. Plant the seed about ½ inch deep. Like all onions, scallions are shallow-rooted, and so need the soil at and near the surface kept moist (they can’t go down deep for water)—but they easily “drown” if the soil gets waterlogged, which is why you don’t want a heavy clay soil. Give the plants some weeks—10 or more—to get established. After that, cut (preferably with scissors or the like) stalks as needed. Obviously you should try not to cut any one plant too heavily, which is why it’s a good idea to plan a goodly number of plants (they don’t take up much space). When you need some green onions, use a trowel to loosen the soil around a clump, lift the clump, take out what you need, and put the rest back in the ground. If you want to start another clump, just reset one of the individual side shoots in its new location. Plant it deep, so more of the lower stem will be blanched. I’ve had the same clone of bunching onions in my vegetable garden now for more than 8 years. They’ve been moved around a lot, but they keep on producing. We’re not so sure about the “take a whole bulblet anytime” approach, but for sure, by taking a little care, you can have both leaves and actual whole scallions year round. A little more detail on the separating: cut the “bunch” into sections with a sharp knife, and make quite sure that each section you intend to re-plant has at least one leaf-growing point on it. Note that scallions actually need (for health) to be divided from time to time (some sources say annually, some say every three years). We think that common sense and that sensitive detector, the human eyeball, will best enable you to judge how much to take when. 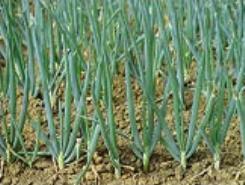 Winter-must-have vegetable *Nebuka onion - how to grow and use Nebuka (bunching) onions. Scallions are simply a species of onion that doesn’t bulb up. They are of the Alliaceae family, the alliums (till recently called the Lilliaecae family). Besides such obvious relatives as bulbing onions, leeks, scallions, and garlic, the Welsh onion’s kin include lillies and hyacinths. The bunching onion was developed in Asia from a wild relative, possibly A. altaicum, which occurs in Northwest China and neighboring Kazakhstan. It was brought to Europe in the 17th century. The “Welsh” in Welsh Onions has nothing to do with Wales: it derives from the German word welsche, “foreign”. You loaded this page on Friday, 19 April 2019, at 16:52 EDT. It was last modified on Saturday, 2 February 2019, at 20:55 EST.